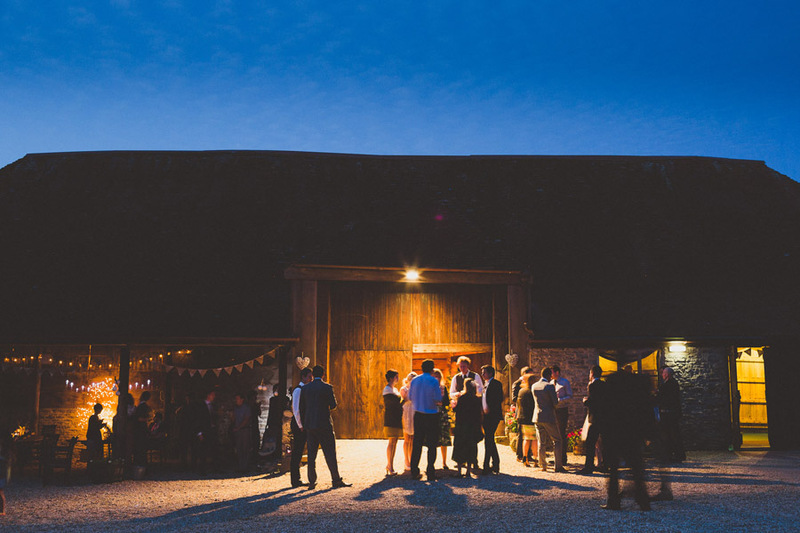 This week I wanted to show you a photograph of a venue, Stockbridge Farm Barn down in Dorset. It’s a great place to get married and this is from karla + pat’s lovely wedding that I photographed there. I take all sorts of images on a wedding day – portraits, documentary, details, landscapes – and to be any good you need to master all of those disciplines and understand what they can bring to the ‘story’ of the day. All photographers are always learning, and one of the things this image taught me is that an exterior photograph of a venue can be a wonderful transition moment in the story. This was taken just after dusk, a time of day that I always find interesting to shoot in – you have the warmth of the lights on the barn but also still a little bit of daylight to add some interest to the sky. And because it was a lovely warm summer’s evening some of the guests were outside enjoying themselves. It’s a great way of showing the transition from day to night and to suggest that the party was going to carry on long into the evening. Great work. I like the interplay of cool sky and warm lighting punctuated by black silhouettes.